It's so hard to decide what to do, or what you CAN do outside this time of year. The shoulder seasons can really be hit-or miss. 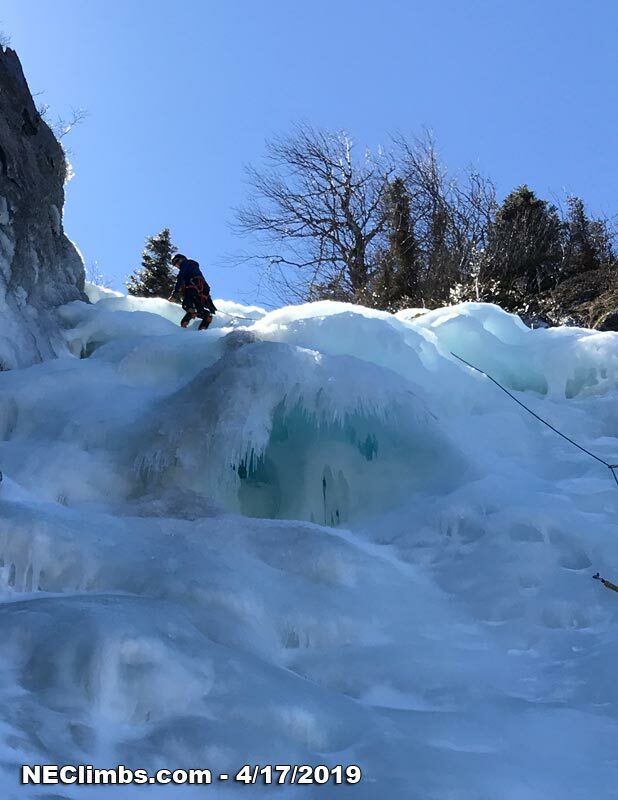 Sometimes you can grab a beautiful day on warm rock on a mid-December or even late March afternoon, or a pitch or two of reasonable ice in early November or mid-April. But it's always a crap-shoot. Having a Plan-B in mind is always a good thing. I've been wanting to get out on some rock, but the days when it's been nice this spring, I've already had something else happening or I've had to work. But I know those days will be here soon enough, even tho on a gloomy day like today it seems unlikely. That said it's easy to jump ahead when it's really not quite safe. 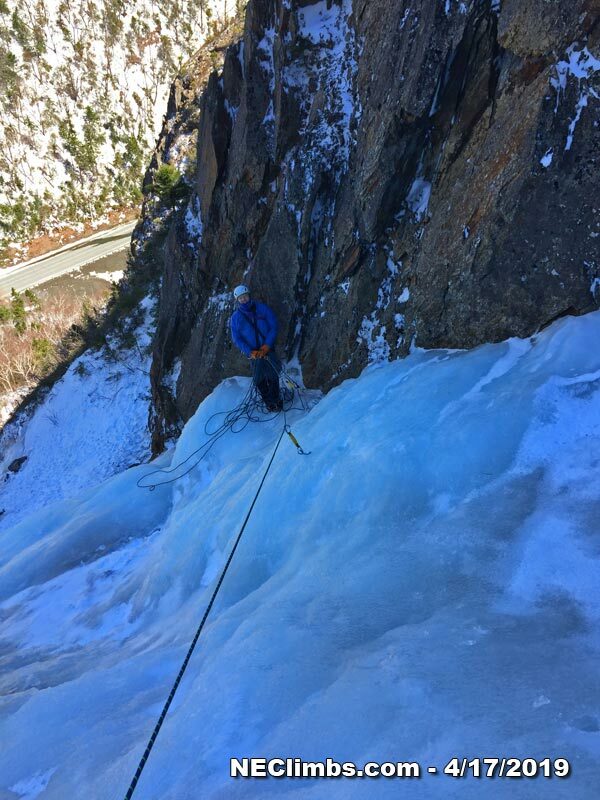 Sure there are folks who can scratch their way up the Black Dike before Halloween, and for several years in a row I soloed Pinnacle on November 3rd, my birthday. But frankly those are rarities. 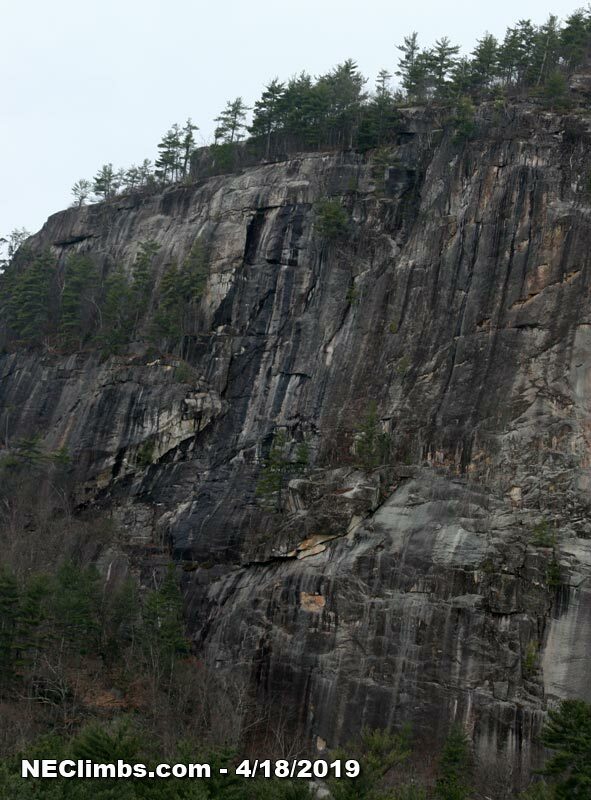 And rock climbing in the very early season on the cliffs here in the Valley can be quite problematic. Talking with Brad yesterday he mentioned that there was a very near-serious incident at the North End a few days ago. Apparently a couple of folks went over there to climb rock on what was a nice day. 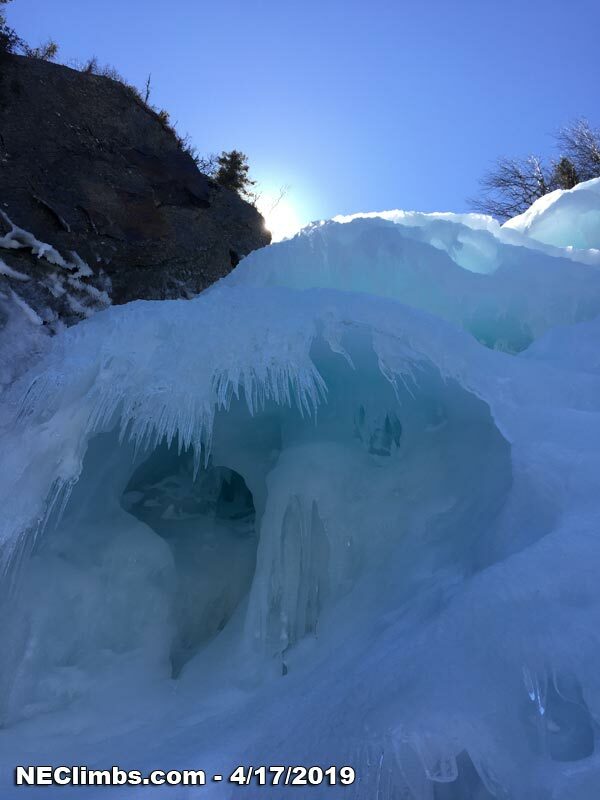 From what he told me, there was a significant icefall from above and they managed to not get hit only by huddling up next to the face, while some pretty massive ice crashed around them! Fortunately no one was injured, but it was a real wake-up-call. This is something that I mention every year. 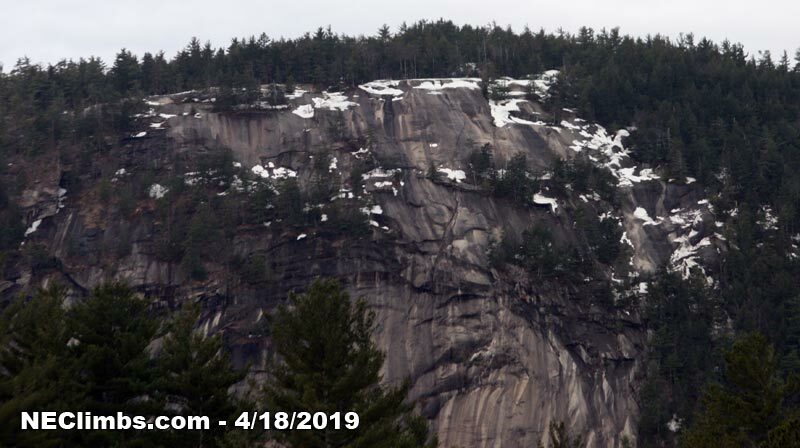 At this time of year there is a lot of ice left up on the Unicorn Ledge above the North End, and frankly almost everywhere on Cathedral and Whitehorse. We're all anxious to get out on the rock right now, I know that I am. But you need to pick your spots. 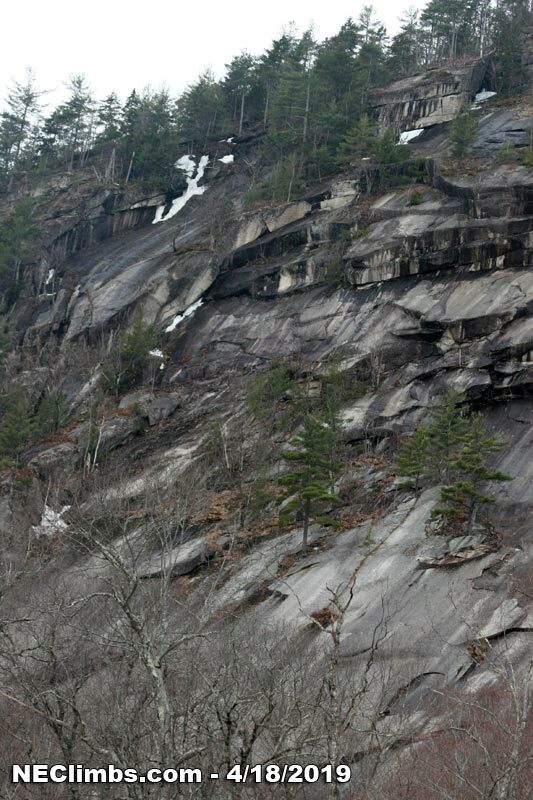 At the very least you need to look very carefully above where you plan on climbing. At the North End it's kind of hard to see what's on the ledges above, but if you drive down West Side Road by the Lucy Farm you can get a pretty good view, even without binoculars. Plus you can see the other stuff above Deidre, the Thin Air Face, Goofers and more. From the Strawberry Fields intersection on West Side Road you can also see the upper slabs on Whitehorse pretty clearly. And when you drive into Whitehorse there are clear views of the South Buttress and it's pretty obvious what's happening above Echo Roof and into the corners above Mistaken Identity. Other than the South Buttress and Humphreys I think we're still a week or two away from climbing the regular moderates, unless you want to head out to the Kanc area and climb at Sundown - which is almost assuredly in good shape. "Heightened avalanche conditions on specific terrain features. Evaluate snow and terrain carefully; identify features of concern. 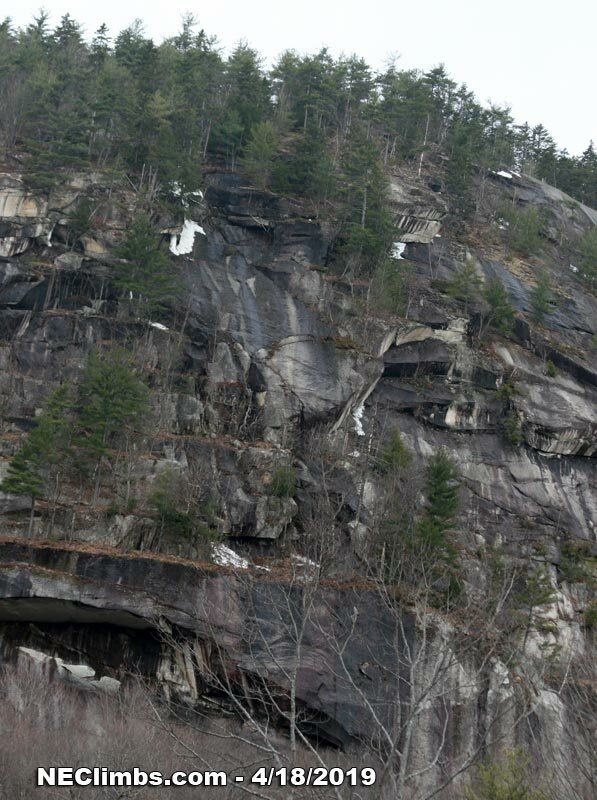 Natural avalanches unlikely; human-triggered avalanches possible. 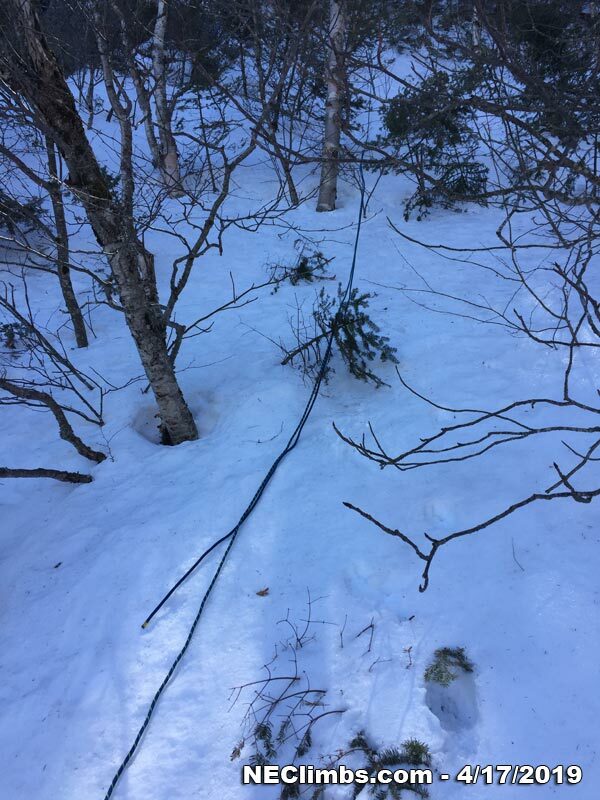 Small avalanches in specific areas; or large avalanches in isolated areas." What does this actually mean? Are people less informed? Are people less risk adverse? What's going on? Needless to say, it's hard to tell. But words matter! "Heightened avalanche conditions on specific terrain features." Raymond Cataract certainly could fill that criteria - wind slab in a steep gully with a choke area in a narrow stream bed. "Evaluate snow and terrain carefully; identify features of concern." The skier was not able to discern what was below him, thus was not able to identify any problematic areas. And of course, skiing alone. Had he had a partner, even if he had been buried he likely would have been alive today. Talking with Brad White a few days following, we agreed that over the past year or so there has been a tendency towards a downgrading of MODERATE, almost to the point of making MODERATE the new LOW! I personally think this has been happening to all of the ratings, and certainly with regards to CONSIDERABLE and below. 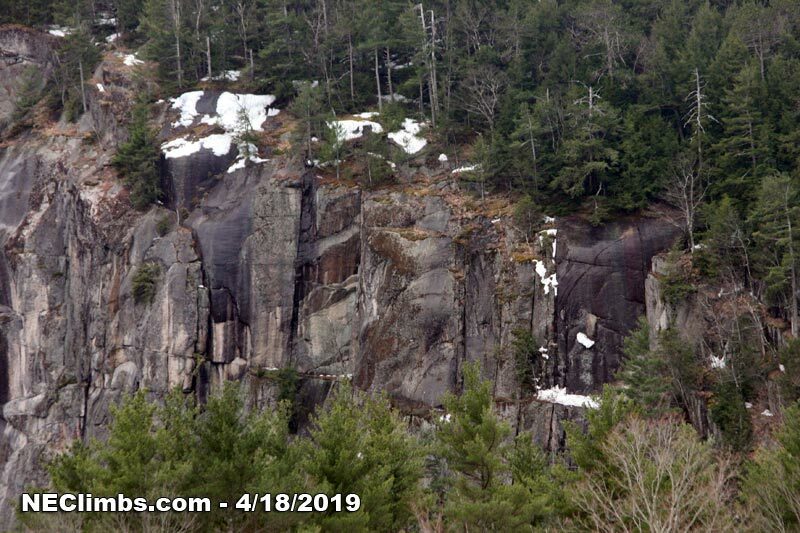 I've have seen may postings by amateurs and pros, skiers and climbers alike expounding the virtues of the backcountry, in a wide variety of conditions, and some more problematic than others. 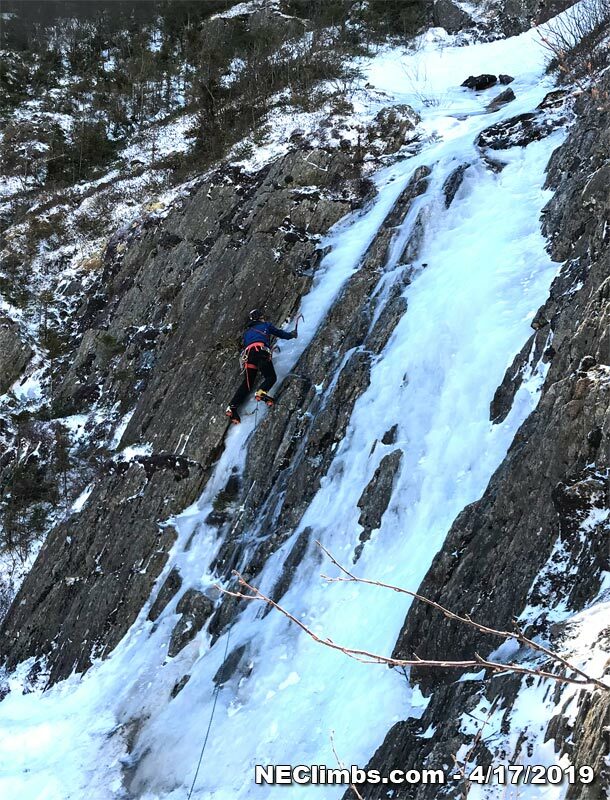 At least once this winter I saw a posting by a climbing team talking about climbing in Huntington about how great it was climbing in the ravine on a day that was clearly posted as CONSIDERABLE danger. And many people on like basically cheered them on. In addition we both have seem pictures of folks skiing on the mountain in conditions that were undoubtedly problematic. Look, I'm no avalanche expert. And at 71 my aversion to risk is certainly higher than it was 20 or even 10 years ago. All I can do is to look at this event, and others over the past few years, and hopefully learn from them. Hopefully you will as well. Enjoy your time outdoors, but be safe friends. 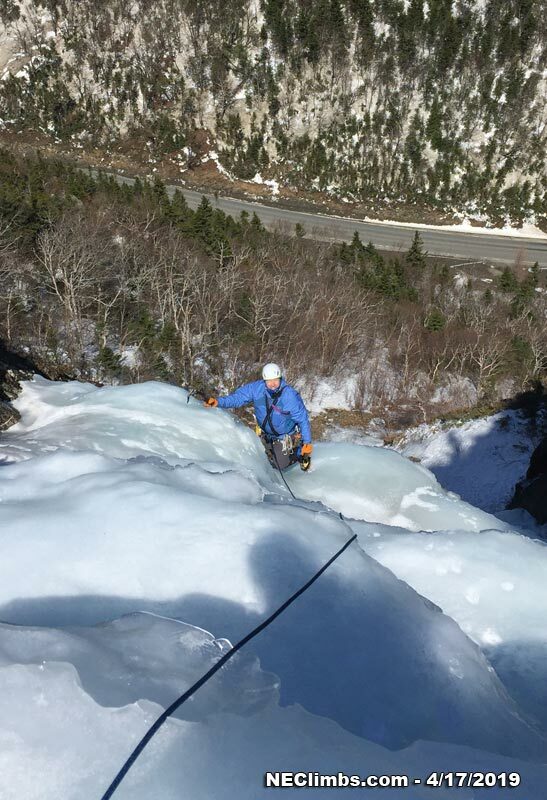 I thought my climb on Parasol Gully 10 days ago would be my last ice of this season. However after seeing some pictures from last Sunday, I thought it might be fun to get back up there one more time. My original plan was to drive up with my road bike and ride the Notch and then solo the gully. But when I mentioned it to Brad he said he'd be up for one more climb and so we headed up yesterday morning. It was an absolutely bluebird day with temps almost 50 and it could not have been better. Here's a few pix from the day. There is also some video on FaceBook and Instagram that really gives you a good idea of what it was like. On the way home we took the long way back through Grafton Notch and it was pretty neat. I've got to get up there next year. Last week was a good one for the bike, getting in a solid 35 miles. 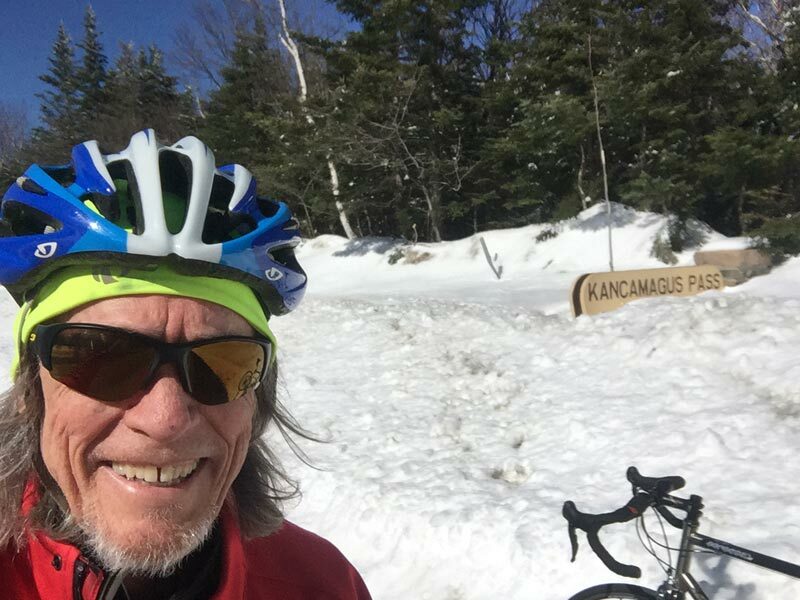 Tho I don't ride on the road very much, I managed to get in my annual ride from Sabaday Falls up to the top of the Kanc and a ride from the Rocky Branch parking lot by Dana Place to Pinkham. It felt good to push a bit more than usual for this time of year. However, on the Pinkham ride I was reminded why I so rarely ride on the roads. In a section of the ride uphill there were 2 cars that came within 3 feet of me, in a place where there were 2 full uphill car lanes and no one around them. No doubt this kind of thing goes with the road-ride territory, but as the season goes along it only gets worse. Too bad, because I do love cranking along on the road. 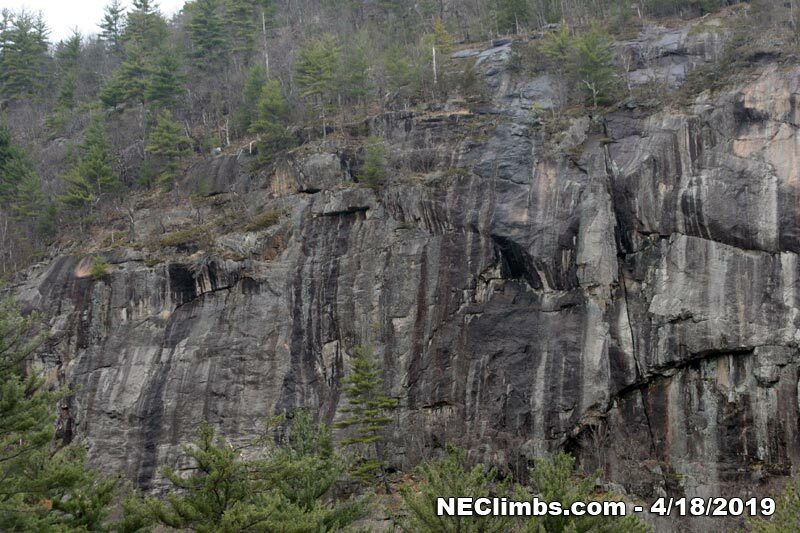 I started climbing when men were men... and we nailed 5.8.